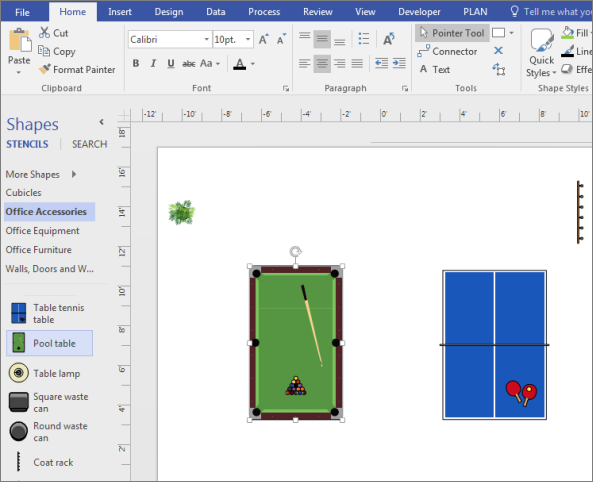 Add a pool table shape, or any other furniture you want, to your floor plan with Microsoft Visio. Set up your office rec room layout without hurting your back. In Visio, on the File menu, click New > Floor Plans, and then click Office Layout. Choose between Metric Units or US Units, and click Create. Click the Office Accessories stencil. Drag a Pool table shape onto the page. Add any other accessories that you want. Click the shapes, and then drag them around the room until you have the layout you want.